The Royal Mint has announced (29th February) four new additions to its 2016 Beatrix Potter range. Following the Beatrix Potter commemorative coin revealed earlier this year, a further set of four coins with full color illustrations will be released in 2016, as part of the celebrations marking the 150th anniversary of the author’s birth. This is the first time that characters from children’s literature will appear on UK coinage. Beatrix Potter defied Victorian convention to live an extraordinary life as the author, artist, and storyteller of the world-famous little tales. In 1890, she added a bunny, Benjamin Bouncer, to her family of animals. He was followed by a rabbit named Peter in 1893. Later that same year, she first told the tale in an illustrated letter to a little boy named Noel, one of the eight children of Annie Moore, former governess to Beatrix. In 1901, she published a small book of Peter’s tales herself. For Potter, these delightful children’s tales were intended just for family and friends. However, in 1902, publishers Frederick Warne & Co. released the first commercial edition of her work, ‘The Tale of Peter Rabbit’, which was an instant success and was followed by 22 additional tales. Her further stories of four little rabbits named Flopsy, Mopsy, Cottontail, and Peter have since captured the imaginations of millions of children around the world. 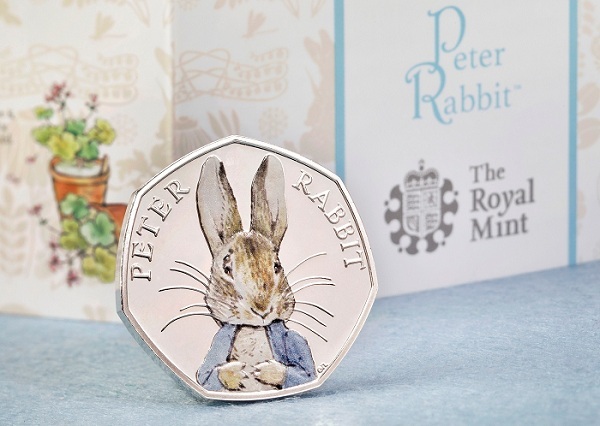 The first coin to be revealed in this series of four depicts the most recognizable of Potter’s creations, and one of the most cherished in children’s literature: Peter Rabbit. He will be joined by three other iconic characters as the series continues through the year. Not wanting to lose the delicate, timeless qualities of Beatrix Potter’s original illustrations, the coins will be available in silver proof featuring a distinctive color-printed design. The color design of this seven-sided 50 pence coin is prepared by Royal Mint artist and engraver Emma Noble and includes a charming image of Peter and his famous blue jacket in vivid detail. 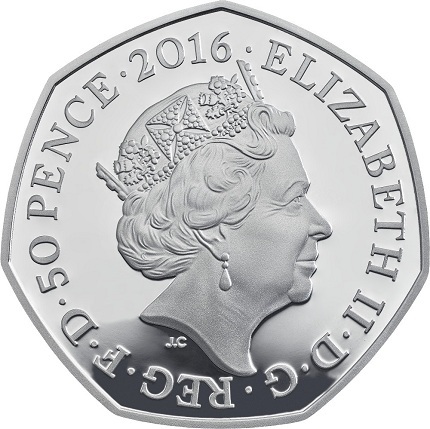 The obverse side includes the fifth official effigy of HM Queen Elizabeth II, designed by Royal Mint artist and engraver Jody Clark and used on all UK circulation coinage since 2015. Alongside the special edition color coins, the four designs struck in cupro-nickel will also be burrowing their way into people’s pockets as circulating versions, which will be appearing in change later this year. The coin is presented in a contemporary Perspex presentation case, with an accompanying booklet and gift box. For more information on this and other coins offered by the Royal Mint, please visit their Web site. International orders will be dispatched where applicable. 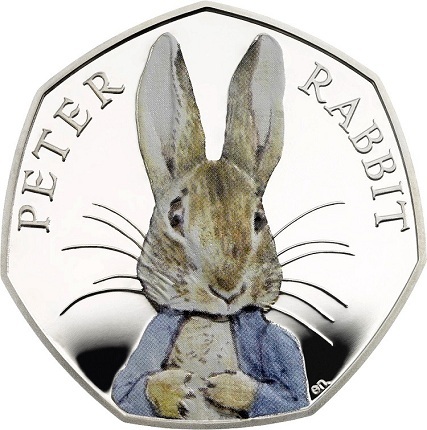 Yes, I agree with that observation as well, that a coloured coin cannot capture the same finesse & depth as a detailed and struck coin – perhaps I’m more of a traditionalist in this regard but – having said all of that, I’m actually looking forward to the release of this coin, simply because I find the design and depiction of Peter Rabbit simply charming and endearing – this I chalk up to my being a real kid at heart..! 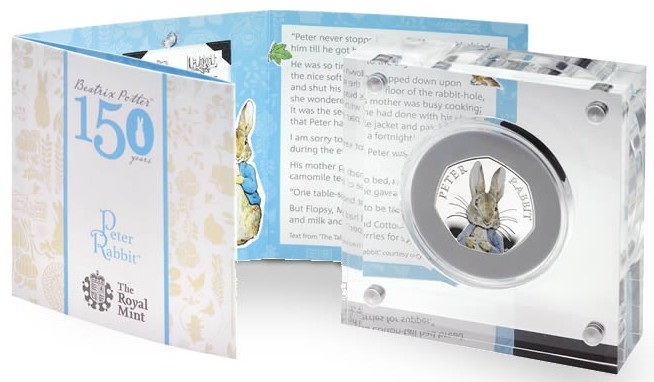 The 2016 Royal Mint Peter Rabbit Sterling Silver Proof Coins were released for £55 each on February 29, 2016. The Royal Mint’s website became jammed due to high demand. Customers had to wait in queue before being admitted to place their orders. 5 days later all 15,000 of these coins had sold out. On ebay these coins have recently sold for £235 = $333.52. In other words, they have skyrocketed 4.27 fold in value. The highest price paid for a 2016 Royal Mint Peter Rabbit Sterling Silver Proof Coin was $999.95 (= £691.19) on May 1, 2016 @ 07:54:23 PDT for ebay Item # 182039748068 sold by thelondoncoincompany. Since it originally cost £55, £691.19/£55 is a tremendous 1,156% gain.